Even if we wrapped horses in bubble wrap they still manage to get themselves into trouble. If you have gone out and found your horse with a cut, there are some things you’ll need to look at before you decide it will heal on its own. There are quite a few wounds that will heal faster, cleaner and with less hassle if we come out and treat them. If you answer yes to any of these questions make sure to call us at 303-841-6006. – Does the cut look like it could be a puncture? If your horse has a puncture wound it is important to have a vet out. It may go deeper than you think, and it may still have something in the wound. Your horse will need to be sedated so we can make sure the wound is clean. We will usually give the horse an antibiotic shot as well. – If the cut is in a fleshy part of the horse, is it deeper than an 1/8″? – If the cut is on a bony part of the horse, is there a flap of skin? Any time a cut over a bony structure has a flap of skin we want to do stitches. This will heal the cut faster, protect valuable structures under the skin, and result in less scar tissue. – Is there heat, swelling, or sensitivity around the cut? Heat, swelling and sensitivity means inflammation. We need to make sure we aren’t looking at infection. If we have any concern of infection it is important that your vet start your horse on antibiotics quickly. – Is there any thick, yellow discharge or bad smell coming from the wound? 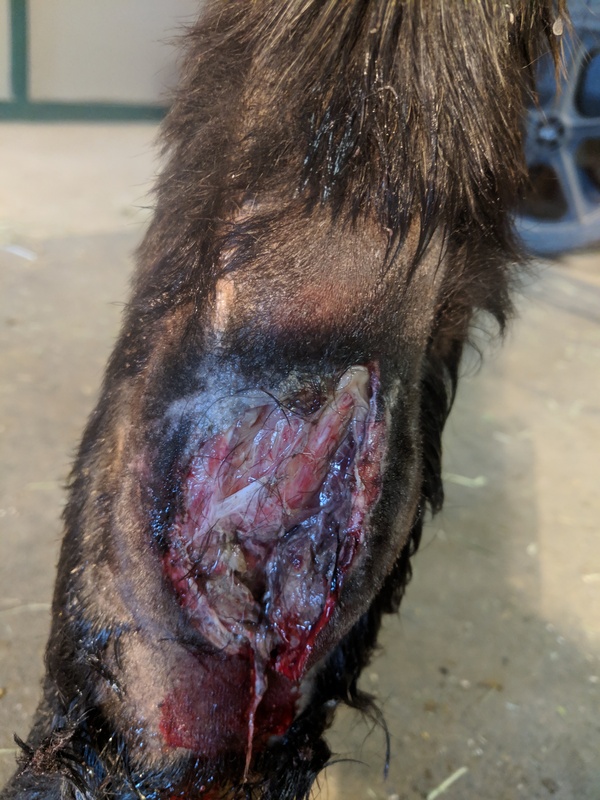 If you see this discharge or smell something bad it is almost certainly infected and you will need a vet to sedate and clean the wound as well as start antibiotics. – If the wound is older does it have proud flesh forming? Proud flesh, or excessive granulation tissue, can hinder the healing process of wounds, and if the wound is over a joint you can lose range of motion. Sometimes we want a little bit of proud flesh, but not often. If there is proud flesh we will probably need to cut it out, so call us immediately. – Does your horse have a fever? A fever means an infection. If you take your horse’s temperature and it is over 100.5 degrees then you need to call us immediately. – Has it been longer than a year since your horse had a tetanus shot? 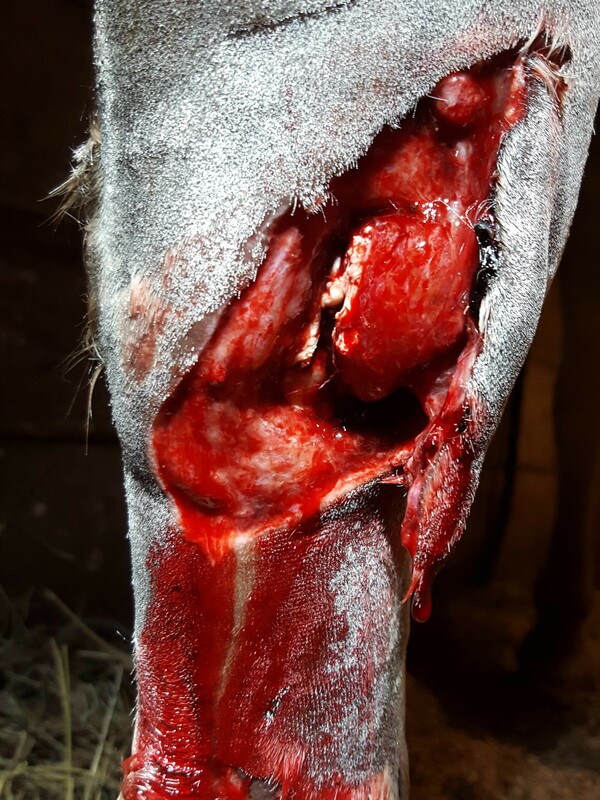 Most spring shots series have tetanus in them, but if you are not sure if your horse has had a tetanus shot within a year call us immediately. 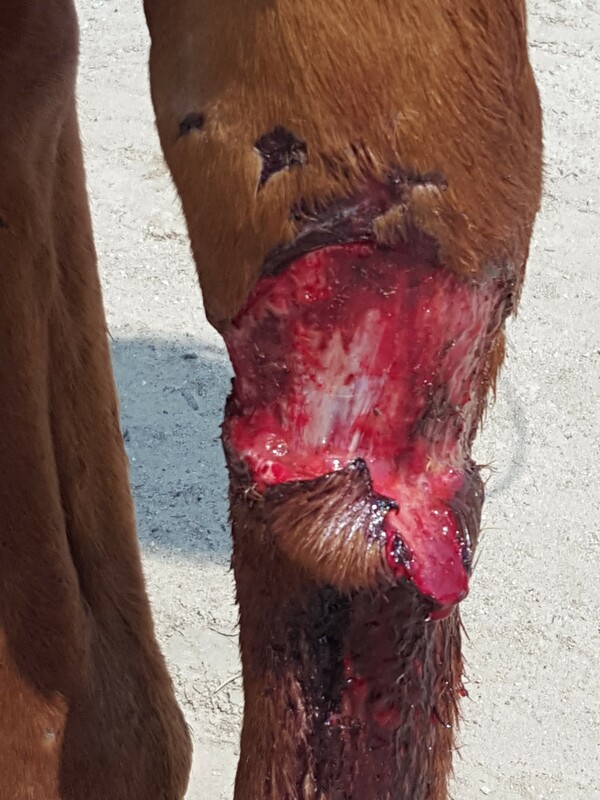 It is important to stay up to date on vaccinations, but particularly tetanus if your horse has cut themselves. If you decide not to get into contact with us make sure you watch the wound very carefully. If at any time you feel the wound is not healing properly make sure to call us at 303-841-6006.